Comets were once thought to be atmospheric phenomena, and there was a time when they were believed to be harbingers of doom.1 Comets are now known to be dirty balls of ices and dust and some even icy dirt balls.2 They travel into the inner solar system displaying, in some cases spectacularly, their long tails, which comprise escaping gas and dust, sublimating3 from their icy surface. This display gets stronger as they approach the sun where the sun’s radiation has a very strong effect on the volatile chemicals in the ball of ice. Driven away from the sun, by radiation pressure and the solar wind, this loss of material depletes the mass of the comet. Some comets have relatively short orbital periods of less than 200 years, whereas others have periods much longer than 200 years. This has become a convenient basis for classifying a comet short-period or long-period. However the more significant criteria of classification is their orbital characteristics: inclination and whether prograde or retrograde in their orbital trajectories. Assuming that a comet is sourced from the original material from the creation of the solar system, if it passes the sun once in 200 years it could only pass 30 times in the biblical lifetime of the solar system, which is completely within expectation. In fact, it would only be 30% depleted of its initial mass. That means it still has 65 more passages left before all the material from its nucleus would be lost. But how could it pass 25 million times as required in the uniformitarian lifetime of the solar system? There is the problem. Why do short-period comets still exist if the nebular hypothesis is the true description of the formation of the solar system? Quite obviously this problem does not exist for the biblical creationist. Long-period comets might have a period from a hundred thousand years up to a million years, it is alleged. But if they too can only survive 95 passages around the sun, they have at most only 95 million years of total life.9 So, why are there still any long-period comets? From the perspective of the uniformitarian nebular hypothesis, where do they come from? The Kuiper belt (KB) is a doughnut shaped region of space beyond the orbit of the planet Neptune wherein there has now be observed of order 2000 bodies orbiting the sun. In reality these should be simply referred to as Trans-Neptunian Objects (TNOs) because there is no good reason to suppose that our solar system abruptly stops at the orbit of Pluto. The first KBO, 1992 QB1, was detected in 1992. Other large bodies comparable in size to Pluto have been found since—for example, Charon, Eris (2003 UB313),11 Sedna, and Quaoar. One of these, Eris, discovered in 2003, is slightly smaller in size to Pluto but more massive, yet Pluto was counted as one of the planets at that time. For this reason in 2006 Pluto was reclassified to being one of the minor planets. TABLE I: A List of the Largest Known Kuiper Belt Objects as of May 2006. Many of the listed diameters are quite uncertain. * Sedna has a highly eccentric orbit which is much larger than the classical Kuiper belt. †The parameters a, e, and i represent, respectively, the semi-major axis, eccentricity and inclination of their orbits. Table I is reproduced from Ref. 10. Figure 2: An image of a comet plunging into the sun (right-hand side). The disk of the sun is covered so that the sun’s corona and coronal mass ejections can be studied. The image was obtained by the LASCO instrument onboard SOHO on July 5 and July 6, 2011. As of 2015 SOHO has discovered 3000 comets this way. Credit: ESA/NASA/SOHO. As of the time of writing of this article the ESA/NASA Solar Heliospheric Observatory (SOHO) spacecraft has catalogued 3,000 comets.13 Some of them were observed plunging into the sun, as shown in Fig. 2. 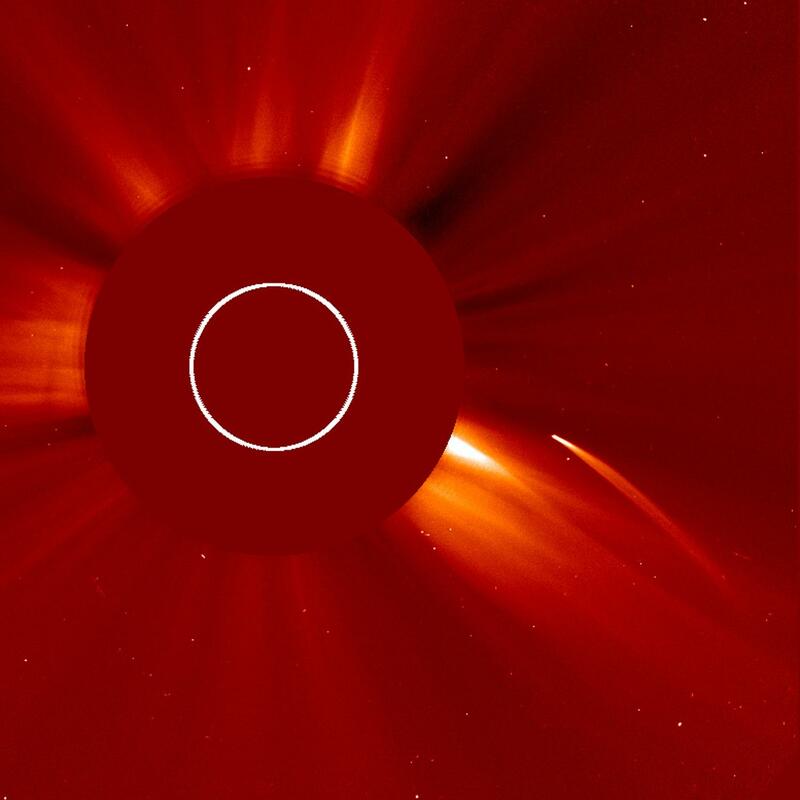 The SOHO satellite has permitted an enormous number of sun-grazing (including sun-diving) comets to be detected. One class of those comets are Kreutz comets, which all seem to have approximately the same orbit and appear to be from the past break-up of a larger comet. Why are We Seeing So Many Sun-grazing Comets? A NASA video (available on YouTube) offers an answer to this question. The overwhelming bulk — some 85 percent — of SOHO’s comet discoveries are what’s called Kreutz comets. Scientists think a single extremely large sun-grazing comet broke up thousands of years ago, leading to thousands of leftover fragments, which continue to follow the same Kreutz path. On average, a new member of the Kreutz family is discovered every three days. Unfortunately, the long journey for these fragments invariably ends as they pass the sun. If they’re close enough to the sun to be seen by SOHO, they’re too close to survive. Others have been discovered getting round the sun since then but most sun-grazers don’t make it past. Figure 3 shows the inclination (i) versus the perihelion distance15 for 3821 comets.16 The Kreutz family are closely grouped (light blue dots in Fig. 3) at very similar inclinations to the plane in which the planets orbit (the ecliptic) and they have similar perihelion distances, very close to the sun. Figure 3: Inclination vs. perihelion distance for 3,821 comets. Reproduced from Ref. 16. Figure 4: Inclination vs. orbital period for 1,152 comets. Reproduced from Ref. 16. Figure 4 illustrates, using different colours, the different families of comets, most of which have only been discovered since 1990. The Jupiter family (red dots in Fig. 4) are a class of comets that have orbits where they pass within 1 AU and 5 AU at perihelion and have aphelion15 between the orbits of Jupiter (5 AU) and Saturn (10 AU), and orbital periods less than 200 years. They all have very low inclinations which means they essentially orbit in the plane of the planets. The well-known Halley family (dark blue dots in Fig. 4) have orbital periods mostly from 10 to 200 years. Above 200 years we clearly see the long-period comets, which are plotted in Fig. 4 as grey diamonds and a few light-blue dots. The Kreutz group that there is data for (light-blue dots) have orbital periods between 500 and 800 years, which also makes them long-period comets. The Halley family and the Kreutz family and the other long-period comets have a whole range of orbital inclinations, which means that they form a spherical cloud around the sun. 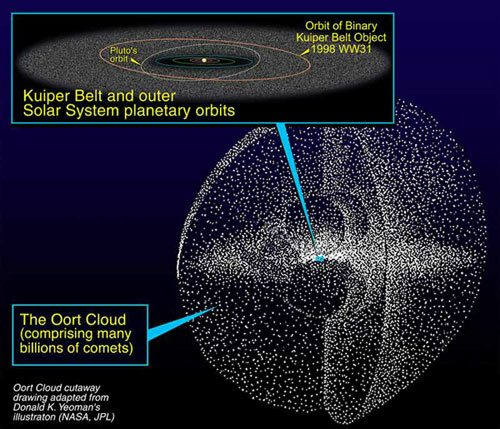 The text-book argument is now being made that long period comets and Kuiper Belt objects originate from the Oort cloud. See Fig. 5, which includes Kuiper Belt objects. Hence the KB’s existence is being linked to an unobserved spherical halo of trillions of icy cometary nuclei, which was only proposed because of the observed existence of comets, both short and long period, in an alleged 4.6-billion-year-old solar system. 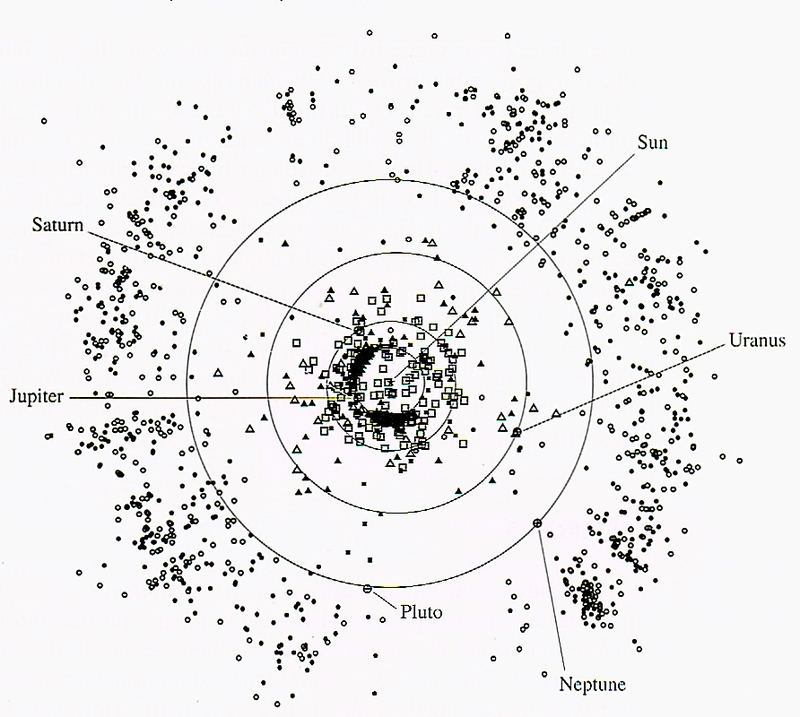 Figure 5: The alleged Oort cloud with the Kuiper Belt inset. Credit: NASA via Wikipedia. The alleged structure of the unseen Oort cloud is described, but that has been based on the believed evolutionary theory of the formation of the solar system.17,18 Since there still does not exist any observational evidence for the Oort cloud it remains as evolutionary storytelling. As of 2016 no Oort cloud has been detected yet 2,504 TNOs, Centaurs and Scattered Disk Objects (SDOs) are now identified.19 Centaurs are fairly large icy bodies that orbit the sun but are not classed as comets, though some say they may become short-period comets, if they are knocked out of their current orbits. As detections have increased KBOs have been classed into three different groups based on their orbital characteristics. Classical KBOs are those that orbit between 30 AU (Neptune’s distance) and 50 AU from the sun, with orbital inclinations less than about 30°. Then there are Scattered KBOs with much higher orbital eccentricities. Eris (2003 UB313) is one example of a scattered KBO. The perihelion distances of scattered KBOs are around 35 AU, and they have greater orbital inclinations than classical KBOs. Scattered KBOs are suggested as another source of the short-period comets. Lastly, a class of resonant KBOs exists that has orbital resonances with Neptune. Pluto is locked in a 3:2 orbital resonance20 with Neptune that protects it from ever colliding with the ice giant. As a result. Pluto (and its binary partner Charon) are resonant KBOs. Any KBOs that have 3:2 orbital resonances with Neptune are referred to as Plutinos (see Fig. 6). Many other different orbital resonances have been observed for KBOs as well.10,22 Figure 6 shows many classical, scattered, and resonant KBOs. Figure 7 plots known KBOs and inner solar system bodies (inside the orbit of Uranus at semi-major axis of 19 AU). This is data from September 8, 2005 but it clearly shows many bodies outside the orbit of Neptune, and seems to define the concept of the Kuiper Belt and TNOs. The locations of KBOs, Centaurs, comets, and Jupiter’s Trojan as­teroids21 are shown. These are projected onto the plane of the ecliptic. And due to the projection effect and the relatively very large size of the symbols compared to the actual sizes of the objects, the outer solar system appears more crowded than it actually is. Even though the Kuiper Belt was proposed independently by Edgeworth in 1949 and Kuiper in 1951, though not as a solution to the problem of short-period comets at that time, there can be no denying it exists. Figure 6: Plot of the eccentricity versus semi-major axis for outer solar system objects. Red points indicate orbital resonances with Neptune as identified by light-blue lines. The planets are shown by black diamonds. Neptune is at 30 AU. Beyond 40 AU (Pluto) is a large group of TNOs (purple dots) called cubewano, which is a name for a classical KBO. Reproduced from Ref. 22. But could the Kuiper Belt have been the supply of short period comets for the alleged past 4.6 billion years? From the above analysis I think it is unsustainable to argue that the KB does not exist. In 2003 there were only 651 KBOs identified and it was argued that they are not KBOs but TNOs and hence there is no Kuiper Belt.12 The argument hinges around the fact that it was proposed as a solution to short-period comets and that the observed bodies are too large to be cometary cores. You can call them all TNOs but they are located in the region that Kuiper and Edgeworth suggested and hence they are KBOs. Whether or not there is a sufficient supply of cometary material there, is another question. But it is fair to note the following. The period of time mankind has been observing this region with very good telescopes has been extremely brief. The ability to detect 5 to 10 km sized objects at 50 to 100 A.U. (see Fig. 8) may be extremely poor hence making a unbiased budget estimate is extremely problematic. There are needed of order 1 billion cometary cores to maintain a supply for the 4.6 billion year uniformitarian timescale, which means only about 1000 are needed on a 6000 year timescale. Figure 8: Estimated diameter as a function of perihelion distance (q) for TNOs. Black diamond at 30 AU represents Neptune. A line indicates the nature of the cutoff that would result from detectability limits; in other words, objects lying along this line would have the same apparent brightness from Earth (assuming the same albedo). Note the lack of detected objects with perihelia beyond 47 AU. Reproduced from Ref. 23. A comet has the mass of 10-10 M⊕ (Earth masses) and early solar system formation theory have that there was about 1 Earth mass of material out there initially. Some argue for a much higher mass of 100 M⊕ in the Oort cloud. So even if it was 0.1 M⊕ initially in cometary core material that gives the evolutionists 1 billion comet cores at their origin. Certainly the existence of about 2000 known KBOs now is consistent with only about 3000 cometary cores at Creation, assuming the smaller cometary cores had a similar abundance to the large KBOs that have been observed. But if there were 1 billion there 4.6 billion years ago, at the observed rate of loss in the solar system it is possible to have reduced that to only a matter of thousands today. Of course a mechanism is needed to eject the comet cores out of stable orbits in the KB over those billions of years. They suggest that the comets have mostly dove into the sun. A total mass of 0.1 M⊕ would have had negligible effect on the sun. Based on the nebular hypothesis and the idea that the Oort cloud resulted from the formation of the solar system it would be reasonable to say that astronomers regard the KB as an initial reservoir of cometary material that led to the formation of the alleged Oort cloud over the alleged 4.6 billions years. Of course this is more storytelling. From the available data it is now clear that most of the long-period comets have a broad range of inclinations to the plane of the orbit of the planets—the ecliptic. KBOs are confined near the plane of the ecliptic so they are unlikely the source of the long-period comets. That leaves only the hypothetical spherical Oort cloud as their main supply. That still has not been observed, there is the claim that there are observed inner Oort cloud objects19—objects orbiting beyond the classical Kuiper belt, with perihelia greater than 55 AU. But that seems to be more special pleading that anything else. The minor planet Sedna has a very wide orbit but still that is within the region of space given to the KB, not the inner Oort cloud, which is supposed to start at 3000 AU. Observations of comets, the Kuiper belt and the Oort cloud are consistent with a young 6000-year-old solar system, in terms of both short-period and long-period comets. The orbital inclinations of most short-period comets is low so it may be a straw man to rule out the KB as a source of short period comets for the uniformitarian theory. It depends critically on the existence of cometary nuclei in the KB, which so far have not been observed in any numbers.19 The orbit inclinations of long-period comets is distributed through all inclinations forming a spherical distribution around the sun. Therefore, the KB cannot be their source, but rather the Oort cloud is needed. Therefore the existence of the Kuiper belt no longer is in doubt and given that most TNO objects are in stable orbits it is erroneous to say it doesn’t exist. Of course that does not necessarily guarantee a supply of short period comets over billions of years. There are other problems as well; many binary TNOs have been discovered for example.19 The short-period comet argument may not be a good young-solar-system argument to make. However since the KB cannot be the source of long period comets the invisible Oort cloud is still needed as the final supply reservoir but its existence remains hypothetical. Sarfati, J.D., Comets—portents of doom or indicators of youth? Creation 25(3):36-40, 2003. Hartnett, J.G., The ‘waters above’, Journal of Creation 20(1):93-98, 2006. Sublimation is the transition a substance undergoes when directly changing from the solid phase to the gas phase without passing through the intermediate liquid phase. Faulkner, D.R., Comets and the Age of the Solar System, Journal of Creation 11(3): 264-273, 1997. Faulkner, D.R., More problems for the ‘Oort comet cloud’, Journal of Creation 15(2): 11, 2001. 1 AU = 1 astronomical unit = the distance from the earth to the sun, about 150 million km. 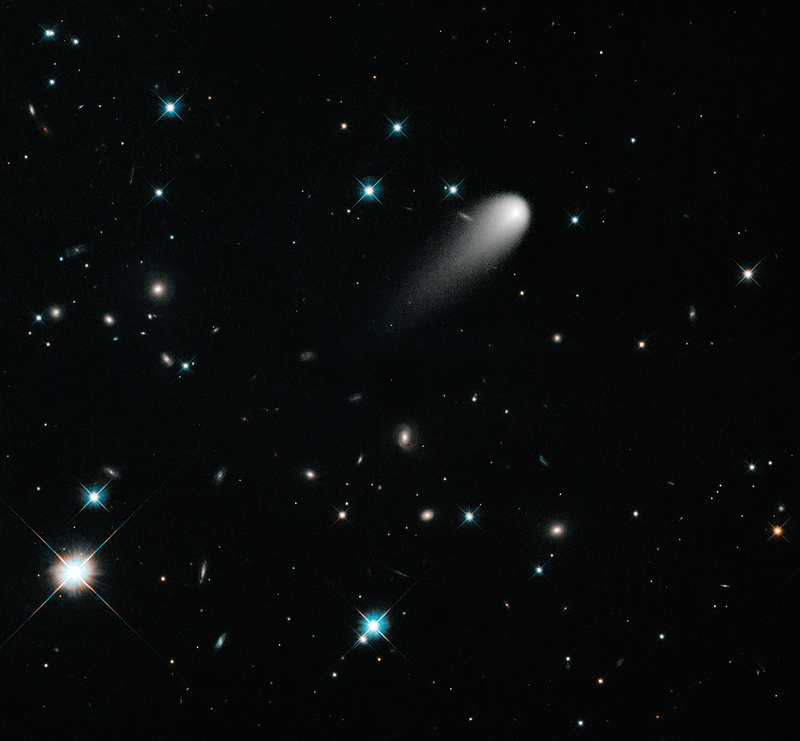 Comets, Vanderbilt.edu, accessed 27 February 2016. This is only 2% of the alleged age of the solar system of 5 billion years. It represents an upper limit only, which is much less than the alleged 5-billion-year age. Carroll, B.W., & Ostlie, D.A., 2nd Edition, An Introduction to Modern Astrophysics, Pearson, Addison-Wesley, 2007. 136199 Eris (2003 UB313), JPL Small-Body Database Browser, Jet Propulsion Laboratory, Caltech. Newton, R., Kuiper Belt Objects: solution to short-period comets? Journal of Creation 16(2): 15-17, 2002. Whoa! Sun-Watching Spacecraft Finds 3,000th Comet, September 16, 2015. Perihelion distance is the comets closest approach to the sun while the aphelion distance is its greatest distance on it path in an elliptical orbit. Johnston, W.R., Comets: Graphs of orbital data, last updated 28 March 2015. Hartnett, J.G., A ‘protoplanetary system’ in formation?, September, 2015. Hartnett, J.G, Planetary system formation: exposing naturalistic storytelling, 2016. 3:2 resonance means the body (Pluto, in this case) completes two orbits of the sun for every 3 orbits that the other body (Neptune, in this case) completes. Trojan asteroids (also called Trojans) are a large group of asteroids that share the orbit of Jupiter around the sun. Jupiter Trojans are distributed in two elongated, curved regions around the two stable Lagrangian points lying 60° ahead of the planet in its orbit, and 60° behind. Johnston, W.R., TNO/centaur eccentricities vs. semimajor axes and resonance objects, last updated 14 February 2015. Johnston, W.R., Trans-Neptunian Objects, last updated 15 March 2015. Some questions. Have we ever observed a KB object ejected from its orbit to become a comet? Is it reasonable to conclude that such ejection “should” happen? I always wondered why would such objects eject and become comets in the first place. But maybe this phenomena has actually been observed and makes sense. I don’t think such an event had been observed because comets are very small and by the time they are out past Neptune they would be difficult to see. They only light up when approaching the sun. Most comets we do observe orbit inside Jupiter’s orbit. My chief argument against the Kuiper OR Oort ‘seeding’ of the comet supply has been “Where are the KBOs and OCOs (Oort Cloud Objects)?’ All the animations I’ve ever seen of this process show these zones as crowded super highways, yet actual statistics show that a single object in either of these areas has literally billions of cubic miles to wander in without worrying about contact (The same for the Asteroid Belt). Regardless of the dimension, the populations are so sparse in ratio to their environment that a constant seeding of the comet population is just statistically impossible. I love the idea that ‘most have been swallowed by the Sun,’ the old evolutionary ‘disappearing evidence trick!’ Blessings on you for your well-thought arguments, Bro. John!